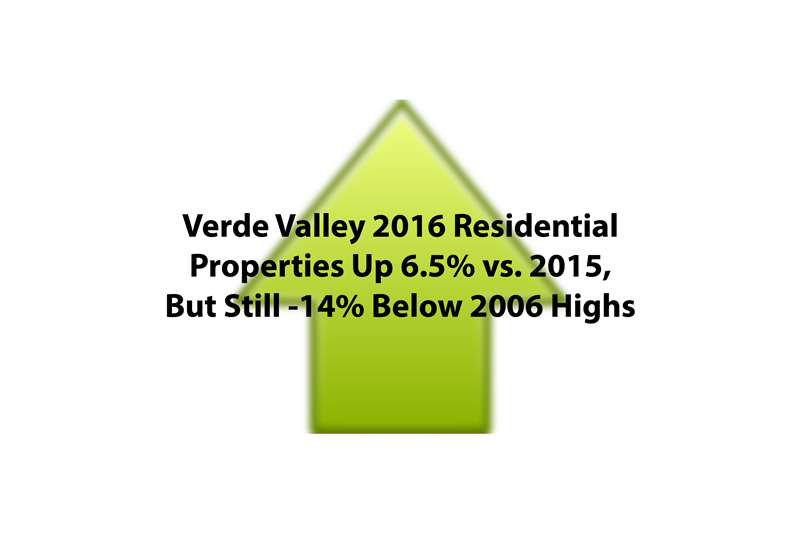 The year 2016 saw residential properties in Sedona and Clarkdale sell for median prices 14.7% and 10.6% above 2015, best performance in the Verde Valley. Price per sq.ft. in Sedona was $227, up 10% vs. year-ago. Clarkdale led the pack with 32.1% more units sold versus previous year showing strong growth in this market. Cottonwood, which started strong in 2016, ended with only a 6% median price growth. See Video Updates for Sedona and Village of Oak Creek here. These get updated regularly. In this issue we are comparing the figures for 2016 with those of 2006, when the market reached its previous high values in real estate. Interestingly, while many other cities in the US have recovered from the huge price drops experienced, the Verde Valley as a whole is still -14% below previous high. Sedona is -18.9% below, Cottonwood – 15.1%, Camp Verde –19.9% and Cornville -21%, representing good buying opportunities. Clarkdale is closest to its previous 2006 high at only -8.9% median price. (1) Median Price means that 50% of the sold homes were above this number and 50% below it. Get a free Comparable Market Analysis for your home with no sales pressure. Just request one and it will be sent to you. Go to http://agsedonarealestate.com/sellers/ for useful tips on preparing your home for sale. Make sure to visit the Pricing and Hoverers page to learn the dynamics of pricing in real estate. Go to http://agsedonarealestate.com/buyers/ and http://agsedonarealestate.com/area-info/ for useful information on neighborhoods, weather, schools, county assessor and learn how Arizona manages water for our future benefit – an important consideration in your decision on where to relocate.